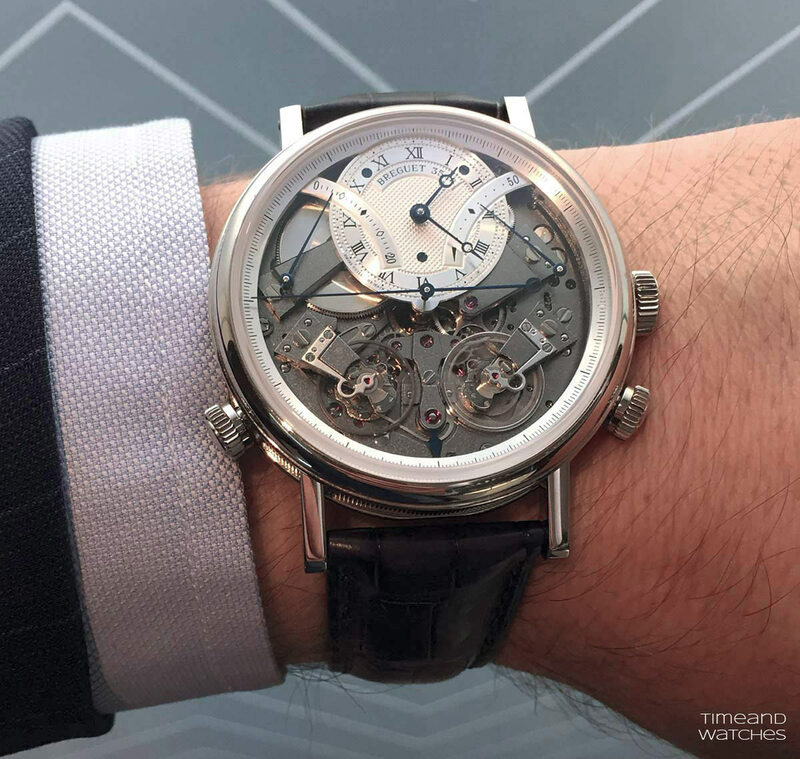 Presented at Baselworld 2015, the Breguet Tradition Chronographe Independant 7077 is one of the most interesting timepieces that we have seen this year, with technical solutions whose impact on watchmaking might be wider than imagined. We first wrote about it last April but we are now back to it to go more in depth. With this timepiece, Breguet demonstrates once again its capability to keep innovating while respecting the watchmaking tradition and the heritage of its founder, Abraham-Louis Breguet, unanimously recognised as the most influential watchmaker ever lived. The key concept driving the development of the Tradition Chronographe Independant 7077 was the equipment of the hand-wound Calibre 580DR with two independent trains, one for the hours and minutes and the other for the chronograph. One evident benefit of having two entirely disconnected trains is that the movement remains completely unaffected when the chronograph is started. This guarantees better chronometric performances. The first going train, the one for the hours and minutes, is regulated by a 3Hz (21,600 vph) balance which offers a power reserve of 50 hours. For the second train, Breguet's watchmakers opted for a 5Hz frequency balance in order to ensure a more precise reading of the elapsed time measure. But how to respect the aesthetic principle of symmetry - so important in this case with the movement components visible on the baseplate - if the two balances beat at different frequencies? In fact, the higher the frequency, the smaller should be the balance wheel. Different frequencies would generally mean balance wheels of different diameters. 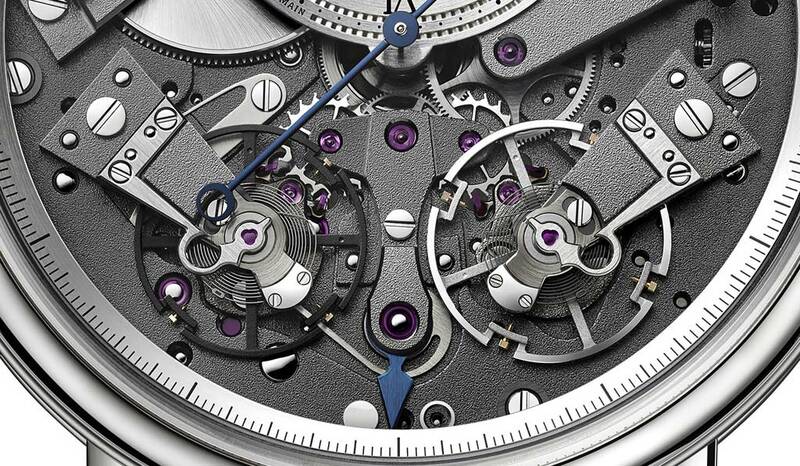 A solution was found in the adoption of titanium for the chronograph balance-wheel. The use of a lighter material made it possible to increase its diameter to match the size of the balance-wheel regulating the time, which is made of a heavier Glucydur alloy. 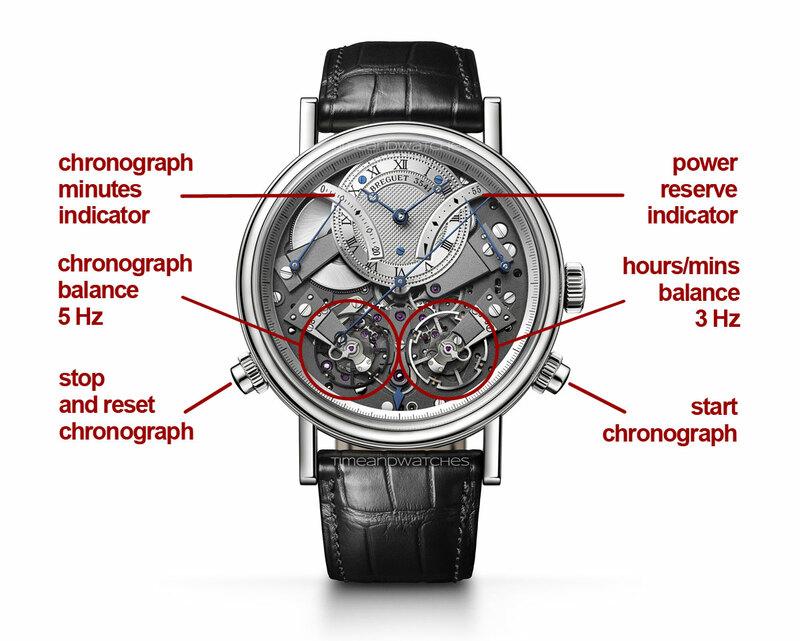 A very interesting innovation introduced with the Tradition Chronographe Independant 7077 involves the method to provide energy to the chronograph gear train. The idea to use a second barrel had to be excluded for space reasons and to avoid the necessity to wind up both the chronograph barrel and the going barrel. 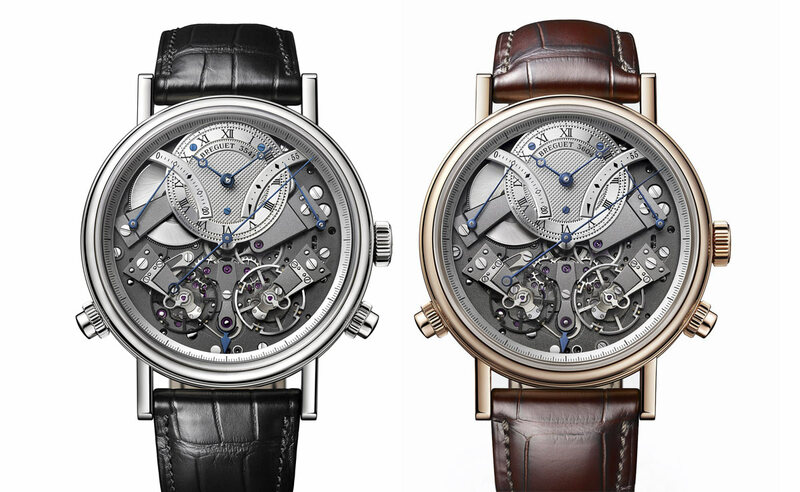 Ingeniously, Breguet patented a system which stores the energy needed to run the chronograph when the user presses the left pusher to reset it to zero. Two screwed pushers control the chronograph operations (with the small blued steel arrow at 6 o'clock to indicate when the chronograph is running). One pusher at 4 o'clock starts the measurement, the other at 8 o'clock stops and resets the chronograph. 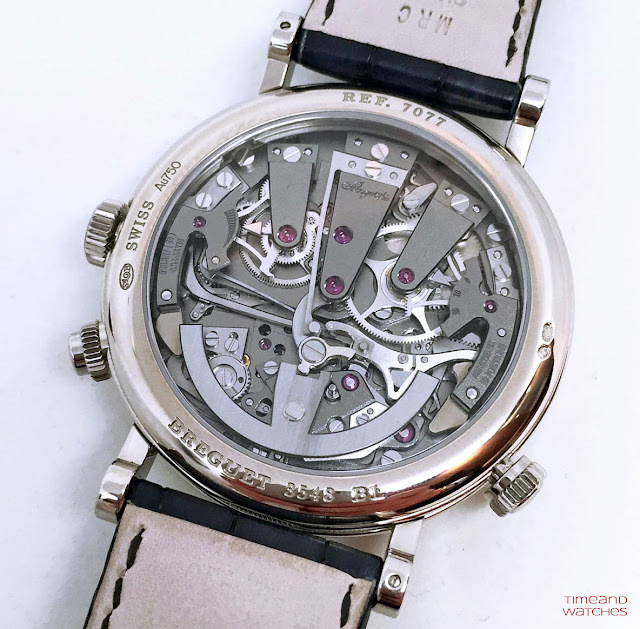 This reset-to-zero operation flexes and arms a special blade spring storing enough energy to run the chronograph for up to 20 minutes and measure short elapsed times as indicated by the retrograde hand at 10 o'clock. The titanium balance-wheel is flanked by two brakes that, working off a cam, free the balance-wheel when the chronograph is started. This happens instantaneously so avoiding any delay in the measuring of the elapsed time. Interestingly, as a result of the independence of the two trains, this energy will always be available, even if the going barrel is fully unwound. This new method might have great potential as an alternative to the winding of a barrel spring. At the moment the energy produced this way would not be sufficient to power an entire movement for enough time but it is possible to imagine that Breguet's researchers could find a way to increase the amount of energy that it is possible to store with this kind of operation. 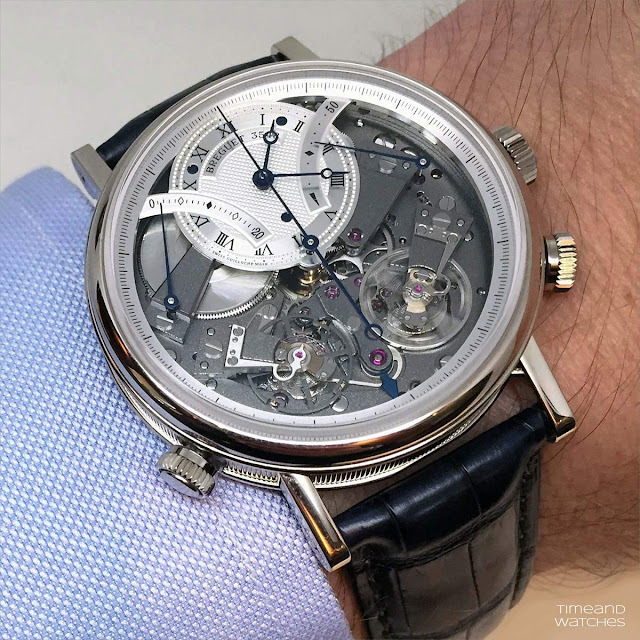 In terms of aesthetics, the frosted finish with dark grey ruthenium coating of the movement creates a fascinating combination with the guilloché hours and minutes dial and Breguet's signature blued hands. The fluted case has a diameter of 44 mm and classic lines which correctly leave the spotlight to the mesmerizing dial. In-Depth: Breguet Tradition Chronographe Independant 7077 Presented at Baselworld 2015, the Breguet Tradition Chronographe Independant 7077 is one of the most interesting timepieces that we have seen this year, with technical solutions whose impact on watchmaking might be wider than imagined. 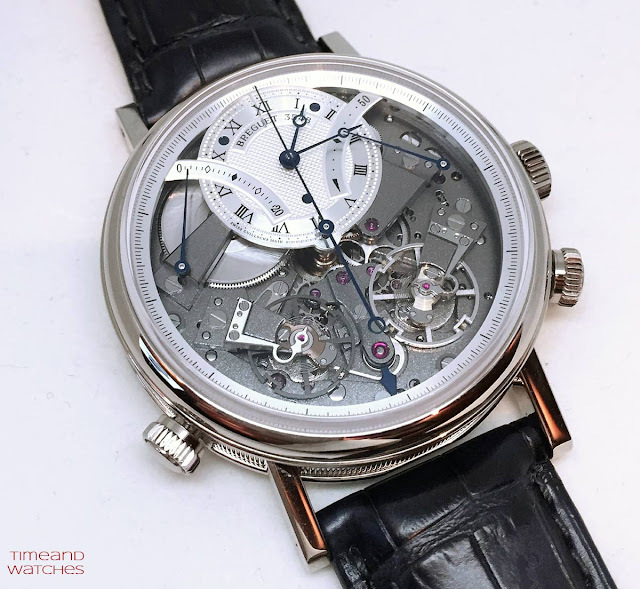 We first wrote about it last April, but we are now back to it to go more in depth.The Breguet Tradition Chronographe Independant 7077 has a price of Swiss Francs 77,000 in rose gold or 77,800 in white gold.